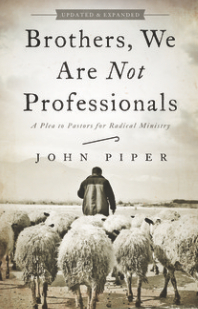 SaltyBeliever Unscripted, the podcast, is giving one lucky winner a free copy of the newly expanded and revised, Brothers, We Are Not Professionals: A Plea to Pastors for Radical Ministry by John Piper. This book is not limited to pastors, or just for brothers for that matter. Many the chapters have great application for the Christian life. You may read a review here or purchase a copy (if you don'twin) here. Contestants may enter by completing one or more of the 6 entry methods below. Completing each individual method will count as one entry, but completing the same option multiple times will still only count at a single entry. Completing multiple entry methods will increase your chances of winning. Good luck! 1. Visit SaltyBeliever.com and contact Bryan Catherman via the Contact Me form. Let him know you'd like to be included in this book giveaway contest. 2. Visit EntrustedWithTheGospel.com and contact Jared Jenkins via the Contact Me form. Let him know you'd like to be included in this book giveaway contest. 3. Share this book giveaway contest on Twitter. Click here to Tweet thiscontest on Twitter. 4. Share this giveaway contest on Facebook. Click here share this contest on Facebook. 5. Share a link on Twitter to the Salty Believer Unscripted podcast. Click here to Tweet a link tothe podcast. 6. Share a link on Facebook to the Salty Believer Unscripted podcast. Click here share a link to thesubscribe to the podcast on Facebook.